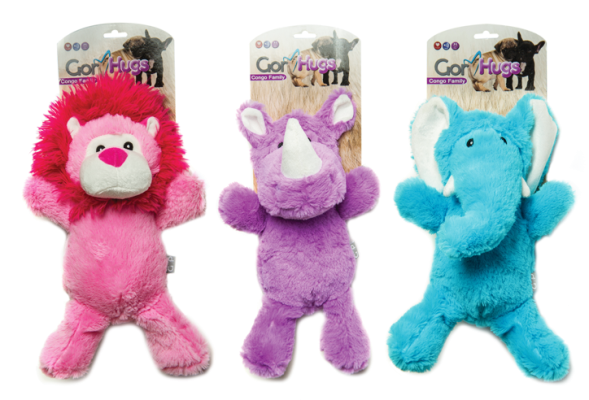 Give one of the Gor Hugs Congo Family a new home and they'll make a great playmate for your pooch! The Gor Hugs Congo Family by Gor Pets are a bright and cheerful bunch sure to make themselves at home with your best friend. These are made from a soft plush fabric perfect for cuddling up to, with a squeak for extra fun. Note: Not intended as a chew toy, but excellent for cuddling. Please supervise your pet while playing as no toy is indestructible. Please ensure any toy is suitable for the activity and for your pets size and chewing style. Remove if worn or damaged.